Everything about Herman Wolter’s statue in Fernwood Cemetery outside of Philly seems calculated to raise a smile. His huge fin-de-siecle moustache and goatee, the fact that he’s staring with great dignity at a huge water tower across the street, and most of all, his unusual outfit. Wolter chose to be remembered as a figure ripped straight from the pages of Jules Verne’s 20,000 Leagues under the Sea, in a deep-sea diver’s suit wrapped around with breathing tubes, a facsimile of his brass helmet at his feet. 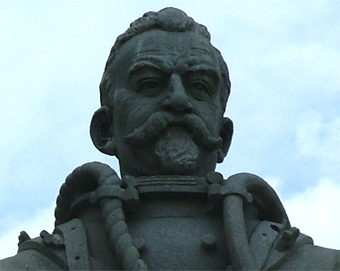 Details about this heroic-looking man are scarce, except for the fact that he died in 1901. We don’t even know whether he ever was a diver, though we think it would be more fun if he wasn’t. Either way, hats (and helmets) off to Herman for wearing his sub-aquatic gear with all the dignity of the Edwardian gentleman he was. 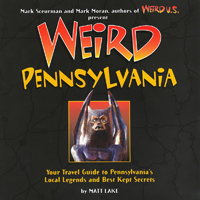 You can read about all of Pennsylvania’s other creepy crypts, unusual interments storied tombstones in Weird Pennsylvania. 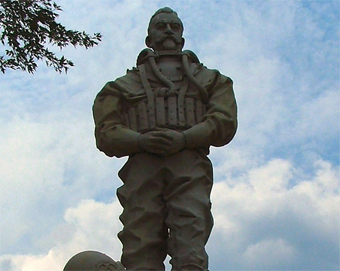 I am emailing you in regards to the statue of Herman Wolter, the diver in Fernwood Cemetery in Philadelphia, PA. Our library has a collection of Wolters materials, including a scrapbook, photographs, advertisements and newspaper clippings.